Spectacular Opals, birthstone for October | Is This Mutton? Opal is softer than most other gemstones so it works best in earrings, brooches and other pieces that rarely encounter scuffs and impacts. When used in a ring the best designs have a bezel that protects the stone, rather than a prong setting that allows the edges of the stone to be exposed. Opals can be found all round the world but the most precious deposits are in Australia. Retailer Gemporia has recently started selling new varieties from Ethiopia. There's a nice story relating to this on their website. If you've been looking at opals you'll probably be aware they come with many different names. 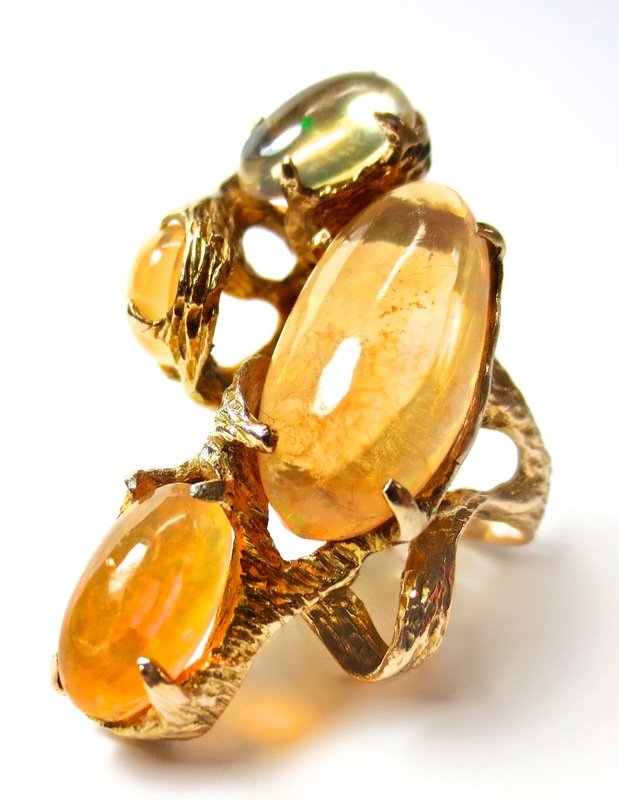 There are three basic types of opal, Precious Opal, Common Opal and Fire Opal. Precious Opal flashes iridescent colors when it is viewed from different angles, when the stone is moved or when the light source is moved. This phenomenon is known as a "play-of-colour". Precious opal can flash a number of colors such as bright yellow, orange, green, blue, red or purple. Common Opal doesn't exhibit play of colour but some specimens can be cut into gemstones that accept a high polish. 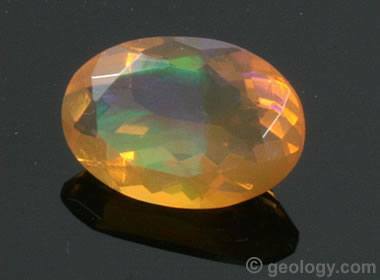 Fire Opal, as its name would suggest, is a colourful, transparent to translucent opal that has a bright fire-like background colour of yellow, orange or red. It may or may not exhibit a "play-of-colour". And then you can get opals which are Fire Opals but also Precious Opals, making them, yes, Precious Fire Opals(below). One thing that an opal isn't is a moonstone. A moonstone is a gemstone from the feldspar group. Meanwhile a "moodstone" is just glass, and its trade name is Opalite. Is there Opal on Mars? There may or may not be life on Mars but there are certainly opals, as discovered in 2008 by NASA's Mars Reconnaissance Orbiter. Is This Mutton? has a jewellery / jewelry board on Pinterest featuring the gemstones which have been showcased so far in the monthly series on birthstones. 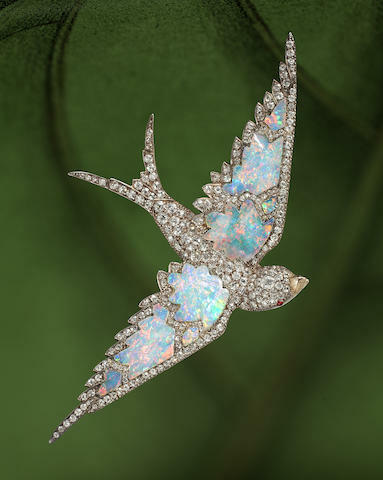 Auctioneer Bonhams sold this antique opal and diamond swallow brooch, circa 1870, for US $50,000 (£38,840). 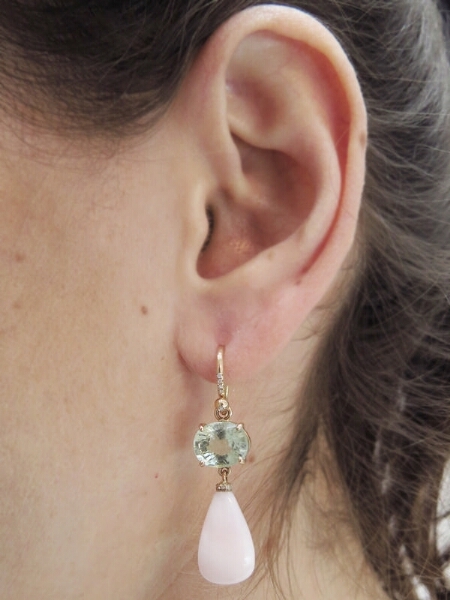 Tourmaline and pink opal earrings in rose gold by Irene Neuwirth at Ylang23, US $5,900. 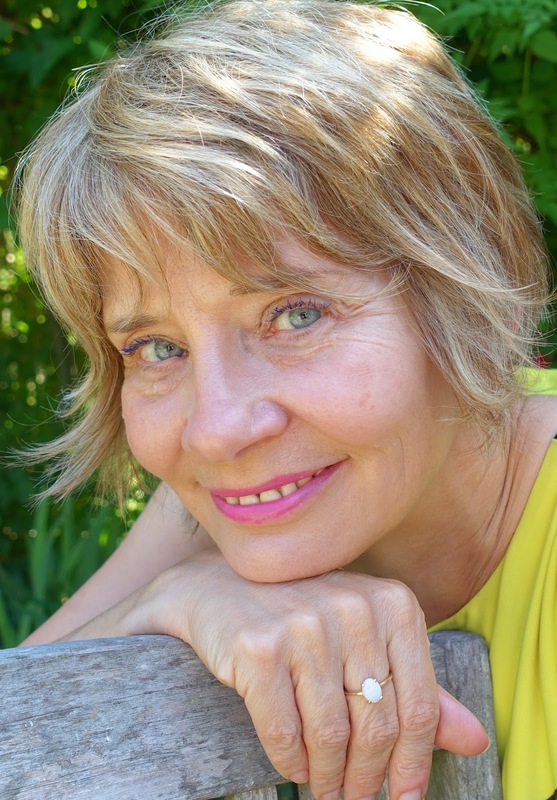 Here I'm wearing an opal ring which I was gifted from Gemporia, 08.carat of opal from the Australian Coober Pedy mine, set in 9K gold. I love the way the stone has a beautiful iridescence when you look at it in certain lights. Have you got any opal jewellery? Do share in the comments below. Check out Is This Mutton's popular series on birthstones: Emerald, Aquamarine, Diamond Pearl, Ruby, Peridot, Sapphire. In November we'll be exploring my own birthstone, the topaz. I am in love with that first ring!! That first ring is calling me :) Lovely post Gail. Thanks for sharing at Welcome To The Weekend Blog Hop. Geez, every month I find a new favorite. Although, opals have been a fav for a long time. My first boyfriend gave me an opal ring that was a treasure but extremely delicate. My daughter loves opals so much that her engagement ring features the gem rather than a diamond. Lovely pieces, Gail.